My After Action Review process is designed for critical company bids. Learn why the big ones were really lost. That is the only way to improve win rates…by quashing the cover ups. 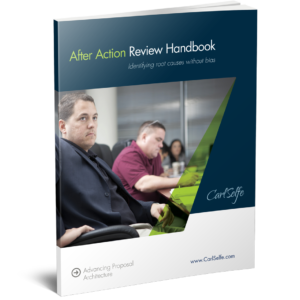 Transform your After Action Reviews by casting aside bias within the process. 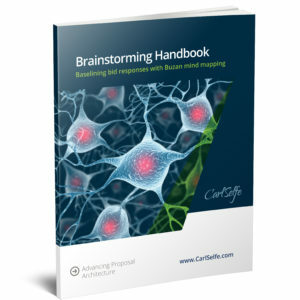 In my 20-page Brainstorming Handbook, you are shown the three iterative creative thinking phases in each Buzan mind mapping session, along with the constraints that keep the participants under control and in check. This handbook graphically shows you the process, your process controls, your outputs, and your timeframes for each session. 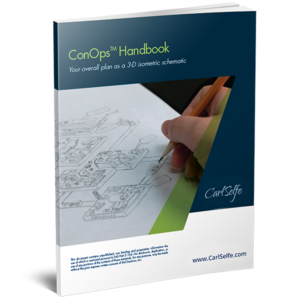 With this 16-page handbook on how to create a Concept of Operations (ConOpsTM), you can transform your proposal efforts by depicting how your operational plan works as an integrated whole. The ConOpsTM is an eagle’s eye view that shows your whole story in one 11×17 graphic. A clear and consistent style is essential for more effective communications and evaluator comprehension. My 85-page style handbook is compiled for Government proposals. 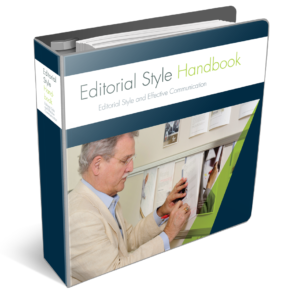 With content condensed and organized for ease of use by writers, you can easily tailor this Style Handbook for your group. Cutting the fog is the key to evaluator comprehension. We communicate essentially with three basic components: graphics, tables, and text passages. 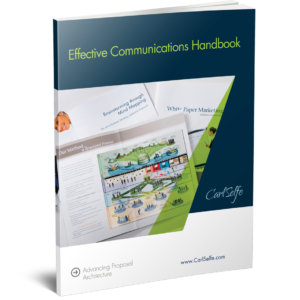 My 16-page Effective Communications Handbook walks you in-depth through each component with what you should do and what you should not do. Transform kickoff meetings by exploiting the team-wide brainpower of assembled subject matter experts, engineers, and writers. 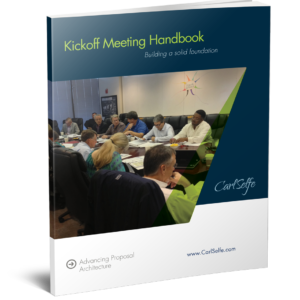 This handbook shows how to make your kickoff teams produce five proposal guidance documents to be used verbatim by all writers. It took me years to define the 41 proposal subprocesses that baselined my system. From a baseline, you can improve after each proposal. 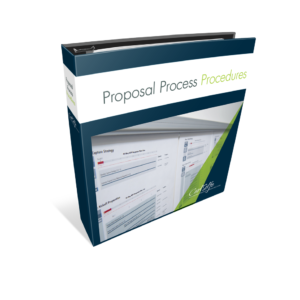 Each of my 41 procedures defines for you the responsibility assignments, guidance documents, inputs, and outputs for you to structure a repeatable proposal process. 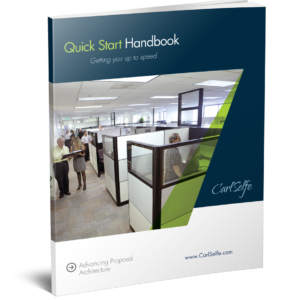 This 24-page handbook contains everything newcomers need to get started in your facility. It is designed to include answers to common questions about accommodations, security, IT, and office services. The Quick Start Handbook is set up for you to add your information to inform your guests. 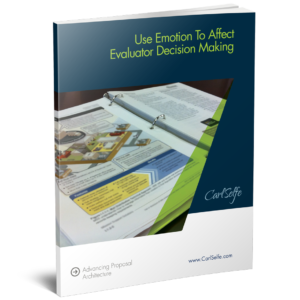 Your proposal’s strategy will lead to the winner’s circle if you inform the evaluator’s inner mind about things that are going to happen way in the future. My 12-page handbook will transform how you drive home your superiority while causing emotional fear about your competitors. Graphically depicted in my 8-page Unsolicited Proposals Handbook, my step-by-step process lays out the three required value propositions that must be in your unsolicited proposal. 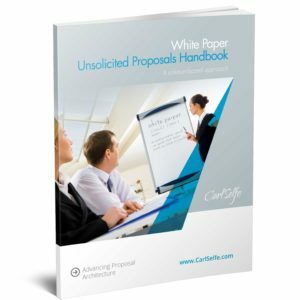 The handbook details exactly how and where to present the white paper to turn your effort more quickly into a contract.